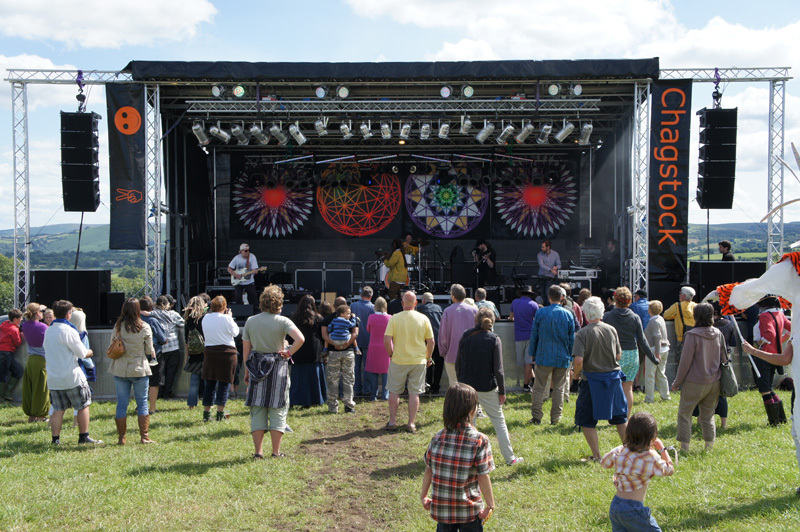 After a very successful 5 years of providing production services to Chagstock, Matrix Productions were contracted again to provide all production for Chagstock 2011. As well as providing the staging, sound and lighting for the main stage, we were also asked to again provide staging, sound and lighting for the Acoustic Marquee. The main stage was furnished with a d&b Q1 line array system with Q Subs, B2’s and Q7’s for infill, along with d&b Max12 monitors, and a d&b Max12/Q Sub drum fill combination. FOH control was a Digico SD8, and monitor control was a Yamaha M7CL32. Many acts played the main stage on Saturday, including 3 Daft Monkeys, Aluminio Roots, No Crisis and John Otway, culminating in a headline set from the Magic Numbers. For the acoustic marquee we provided a Nexo Alpha-E system, with L-Acoustics12XT monitors, and a Midas Verona 440 for FOH and monitor control. The acoustic marquee had a diverse range of acts from future ‘The Voice’ contestant Adam Isaac, Jo Harman and Morning Rush to the fantastic Show of Hands returning to headline the Friday night.